Congratulations to the Mayor and Mrs. Taveras who were married today in a surprise ceremony. And happy first birthday to their daughter Farah Rose. 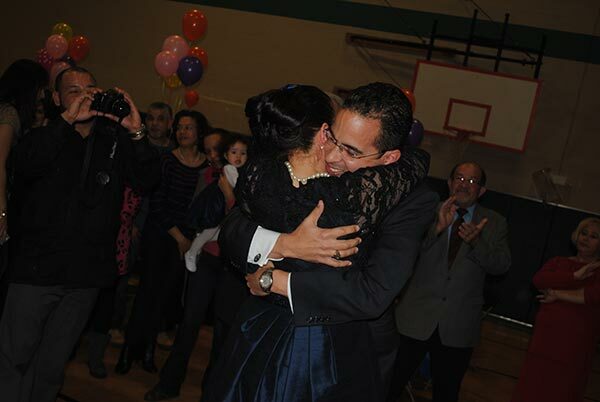 Providence Mayor Angel Taveras and Farah Taveras (nee Escamilla) are pleased to announce that they were married today in a surprise ceremony during a private party held to celebrate the first birthday of their daughter, Farah Rose Taveras. The ceremony was performed by Mayor Taveras’s uncle, Rhode Island District Court Judge Rafael A. Ovalles, and attended by about 100 family members and close friends, including Cranston Mayor Allan Fung. The Mayor and Mrs. Taveras were engaged earlier this month. They’ve since decided that the planned gathering for their daughter’s birthday would be an ideal venue for celebrating their marriage. Mrs. Taveras, 33, has chosen to be a stay-at-home mother after working as a legal assistant at the Providence-based law firm Pannone Lopes Devereaux & West. Photo from the Mayor’s Office.